The fifth of May 2013 marks the bicentenary of the birth of the Danish philosopher, theologian, and man of literature Søren Kierkegaard. He will be celebrated in Copenhagen and around the world. What estimate should we form of him today? Kierkegaard did not doubt his mission: ‘I know what Christianity is. And to get this properly recognized must be . . . to every person’s interest, whether he be a Christian or not’. Christianity, he contended, entailed belief in an interruptive event (an Incarnation of God) which does not fit the normal flow of history. The Enlightenment had been a blow to the Christian claim. Politely suggesting that any such ‘historical’ religion was the business of theologians, Kant treated the biblical saga of Fall and redemption as but a mythical expression of human self-understanding. In his wake, Hegel reduced Christianity simply to ‘concepts’ and thought these concepts a mere stage in human development, while Feuerbach pronounced Christian doctrine a projection. As a student, Kierkegaard witnessed the advance of scholarship that sought to explain biblical texts in terms of their setting of origin. Cognisant that the notion of an Incarnation, a God/man, is to reason paradoxical (a contradiction in terms), Kierkegaard advocated relating to it out of the passion of subjective inwardness that is ‘faith’. We should recognise, however, that he held to pre-modern suppositions that made such a notion, if not rational, at least conceivable. Living a century and a half after Newton, Kierkegaard had little sense that nature and history form an inter-related causal nexus; that events are one of a kind, predictable and repeatable, there being no one-off occurrences. He was, in the parlance of the day, a ‘supernaturalist’ not a ‘naturalist’, believing in miracles. God is conceived to be directly behind each and every happening, such that just about anything can transpire. For Kierkegaard, pressing directly on our world, the eternal is bound into each moment in time. It is within such a context that the human being is held to be a synthesis of body and spirit, through his very nature made for divinity. Thus Kierkegaard commented that, while it is true that (as Aristotle had said) a plant gives rise to a plant, a man to a man, ‘by this nothing is explained, thought is not satisfied … for an eternal being cannot be born’. Within such a context, once more the idea of Incarnation acquires plausibility. Was it the subsequent Darwinian revolution that led humanity to conceive of their nature otherwise? Kierkegaard’s outlook had social implications. Far from uncaring, his former professor remarked: ‘It was typical of him to want to look after precisely those people whom the public did not value’. Nevertheless, in view of eternity, our present existence becomes for him a ‘meanwhile’. Thus he considered it of more importance that a beggar behave beautifully, mindful that, disturbed by his presence, others may be led to question God’s goodness, than whether the man live or die. He advises that a charwoman should not aspire to be called ‘Madame’, given that the world is but a stage on which we act our roles, while before God she is anyone’s equal. No wonder Hegel had averred that ‘the eye of the Spirit had to be forcibly turned and held fast to the things of this world’. His disciple Marx was five years Kierkegaard’s junior. Fearing in his blacker moods that his authorship, penned in a minor European tongue, might lie undiscovered, Kierkegaard remarked of his fellow countrymen: ‘I am regarded as a kind of Englishman, a half-mad eccentric; my literary activity… a sort of hobby [like] fishing and such’. Would he could but know of the affection and respect in which in our day he is held by those who will gather to celebrate his bicentennial. His work is translated into languages from Korean to Hungarian. 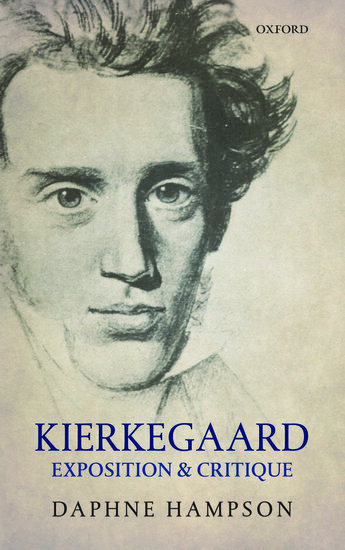 An eclectic and imaginative author, Kierkegaard is considered the Ur-father of existentialism, the originator of dialectical theology and (on account of his style) the progenitor of post-modernism. Regarded by many Danes as the greatest prose writer of their language, his provocative authorship in equal measure engages and delights. Confronted with one who in terms of the span of history lived so recently yet whose thought-world is so foreign, we are brought to recognise the remarkable revolutions that we in Europe have undergone. Fascinated by steam engines and hot air balloons, Kierkegaard (inconsistently) did not much like the march of history, thinking scientific progress to distract man from his true ends. To step into his shoes is a startling revelation as to differences in presuppositions. What, however, would seem to make little sense is to contend that Christians have always proclaimed ‘faith’ in the face of ‘reason’, failing to consider the context that made the object of such a faith thinkable. From this it does not follow that we should not think out how today we had best conceive of that dimension of reality that is ‘God’. Daphne Hampson holds doctorates in history from Oxford, in theology from Harvard, and a master’s in Continental Philosophy from Warwick. The author of Christian Contradictions: The Structures of Lutheran and Catholic Thought, she has for many years engaged with the Lutheran tradition, in particular the work of Kierkegaard. Author of Kierkegaard: Exposition & Critique, you can find more about Daphne Hampson by visiting her website. Subscribe to only philosophy articles the OUPblog via email or RSS. Image credit: Kierkegaard statue. Photo by Arne List. Creative commons license via Wikimedia Commons. Kierkegaard (presumably) is paradigmatic of honest, sincere and searching Christians who refuse to accommodate their faith to the prevailing mindsets of the time in spite of the anguishing fact that the philosophical and theological ground on which they stand is being undercut from below by the very mindsets with which they are locked in mortal combat. Daphne Hampson seems to have unveiled this lacuna which plagues Kierkegaard studies (theological as well as secular)with admirable perspicacity.